Iron, steel, and lead is not the name of a heavy metal band. They sort of tie my Friday Recommends together this week. First, here is where our #4 daughter has been for the last three weeks: The Celtic-Iron Age City of Pintia, learning the techniques of excavation by doing some. She called me last night and told me about some of the total awesomeness of the whole experience, including getting to see actual cave art. She didn’t go alone and run into a unicorn, but it sounded even more fantastic. Amanda, a.k.a. 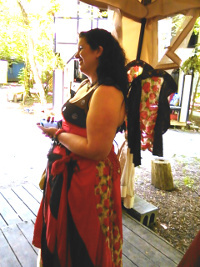 Mimi, a.k.a K.A DaVur is representing Three Fates Press / Line By Lion Publication at the Kentucky Ren Faire, which got me thinking about the Society for Creative Anachronism, of which I was once a member. It’s time for the 43rd Pennsic War, and I plan to maintain my perfect record by not going to this one, either. Follow the link to the Pennsic web site, though; the story of how the wars began is well worth reading. And now, here is why I’m on Facebook: It was on Facebook that I saw this piece which I’m sharing with you here and now. Best Response to Craigslist Ad Ever. And on that note, I leave you. Tomorrow is my first Caturday since Katya passed. Mom’s cat, Sweetie Pie, has agreed to help me out for a while. She’s Sweetie Pie by name and by nature. A WRITING PROMPT FOR YOU: Send a character to a historical recreation event. This entry was posted in Friday Recommends. Tagged medieval and renaissance. Yikes. I went to that first war and concluded that if God had wanted us to make war, He wouldn’t have kept raining on us. So I warred no more. The story of HOW the Midrealm won that war is a tale of itself. Be assured that slyness was involved. Jane, I have no doubt there was nefarious activities afoot. What’s a war without a certain amount of treachery, after all?